Companies that manufacture body cams for police agencies and officers, are strategically positioned to take advantage of an emerging trend. Last Sunday The New York Times ran an article titled “Today’s police put on a gun and a camera,” which detailed the race among some law enforcement agencies to put body cams on cops. In New York City, 60 cops will be wired for sight and sound as part of a court-ordered pilot program according to Boston Magazine. 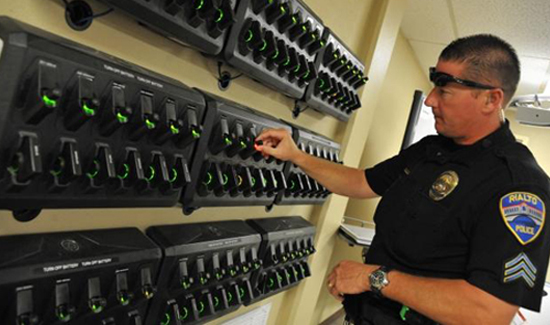 Agencies in Florida, Arizona, Virginia, and Washington are also outfitting their officers with body cameras. One of the cities where the use of cameras has had a massive impact is Rialto, California. A year after they were first introduced to the force, a 2013 study about the department’s body-camera program showed that both complaints from citizens about officer conduct and use of force pretty much fell off a cliff. Now a group out of Boston is pushing for body cams for police officers there. Other Massachusetts agencies are also considering cameras. The Worcester Police Department said they are “reviewing whether the use of cameras would be a good addition” to the force in order to insure public safety, according to the Worcester Telegram. Boston Magazine reached out to the Boston Police Department and the Boston Police Patrolmen’s Association but did not get a reply.